Easily modified, repurposed shipping containers offer comfortable and efficient living spaces. 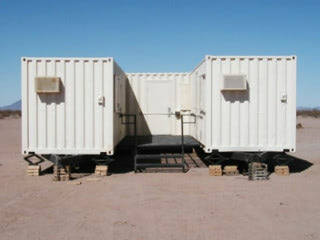 The heavy-duty steel construction also provides a secure environment for remote locations. Falcon's Living Containers are easily transported, rapidly deployable, and can even be stacked to conserve space. Consider container housing for your construction job site, oil field application, or recreational purposes. 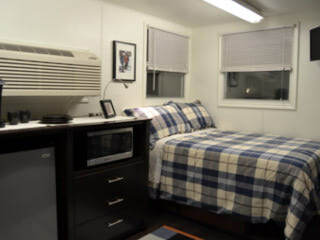 Durable, climate-controlled, and cost-effective, container housing solutions keep workers safe and comfortable without breaking the bank. Containers can be modified to include sleeping, dining, relaxing, and bathing spaces. 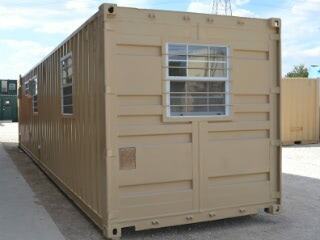 Built to endure extreme weather conditions, repurposed conex containers provide a safer, sturdier alternative to RVs and traditional mobile homes. Seasonal workers stationed in remote job sites can rest and relax in an air-conditioned, portable bunkhouse. Learn how Falcon created a safe, secure, and mobile housing solution for the Department of Homeland Security’s border patrol team. Mobility, dining space, and comfortable restrooms were key to this container housing solution.